Renewable energies are on the rise in Minnesota, increasingly contributing to the state’s energy supply. The portion of the state’s energy generated from wind is rapidly growing — up to almost 13 percent today from 3 percent in 2005 — and its solar potential matches portions of Florida and Texas, according to the state Department of Commerce. Minneapolis-St. Paul International Airport recently announced a $25 million project to cover two airport parking ramps with a 3-megawatt solar installation that will be the single largest solar installment in the state. As renewable energies continue to expand, a team of experts at the University of Minnesota are researching new ways to integrate them into the power grid. Using advanced sensors and control systems, the team aims to think about new ways renewables and demand management could be used to boost the power system’s reliability and shift industrial energy demands to lower costs, initially in rural Minnesota where there is already a sizable renewable energy infrastructure in place. The project is part of MnDRIVE (Minnesota’s Discovery, Research and InnoVation Economy), a $36 million biennial investment by the state that aims to solve grand challenges. As a part of MnDRIVE’s Transdisciplinary Research Program, the project will bridge multiple research areas, bringing together experts from across the U. “Because renewable energy involves policy, economic, social and environmental factors, it is a highly complex field requiring many partners at the table. Working collaboratively, we’re able to ask questions in an integrated way,” said Elizabeth Wilson, Ph.D., associate professor with the U’s Humphrey School of Public Affairs and lead principal investigator with the project. “Together, we’re able to have an incredibly rich conversation and advance policies that are both smart and sustainable,” Wilson said. The project takes on one of the principle challenges of renewable energy: it is variable and changes with the availability of sun and wind. In the Upper Midwest, wind often blows at night, when the overall demand for electricity from residents and businesses is lowest. Meanwhile, solar photovoltaic panels — which turn sunlight into electricity — work best on a clear sunny day. How to match renewable energy generation with electricity demand remains a challenge. For example, during peak usage times, like when air conditioners run on hot summer days ensuring adequate supply often means cutting demand. The differences could be drastic, from almost costless to hundreds of dollars per megawatt, depending on how much energy is being produced and how high the demand is. By allowing the system to better manage demand, and sync it with renewable power production, more renewable energy sources such as wind and solar could be integrated into the electric system. If the electric utility company can reduce the need to purchase expensive peak power they can pass those savings on to energy consumers and potentially reduce the environmental impact of the electricity system. To that end, the project aims to work with industrial facilities, which use large quantities of electricity, to explore what their ability is to strategically shift their energy use. This could be shifting away from times of peak demand or using more energy when prices are low. For example, if a major food production plant were to move the most energy-intensive step in its daily operations to a low-demand and high-renewables generation time, such as at night, it could allow the utility company to provide low-cost energy, leading to lower overall costs for both production plant and the utility’s other customers. While coordinating with market demand can better integrate renewable energy into Minnesota power grid, control systems can also improve individual generators. Peter Seiler, Ph.D., assistant professor with the College of Science and Engineering’s Department of Aerospace Engineering and Mechanics, is designing wind turbine systems that can sense and respond to demands in the power system. A more responsive turbine can adjust its rotation to optimize efficiency, allowing it to capture more energy while reducing maintenance costs from wear and tear. 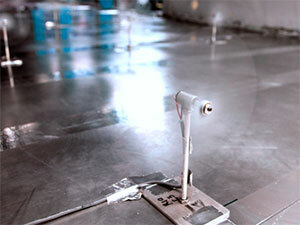 Researchers model turbine efficiency in a wind tunnel at St. Anthony Falls Laboratory. Working with such diverse experts can be challenging, and this group has benefited from past support. The MnDRIVE project allows this interdisciplinary team to explore new research directions. They were originally funded for another project by the Initiative for Renewable Energy and the Environment. IREE was a competitive grant formerly offered through the U’s Institute on the Environment and funded by the Minnesota Legislature to bring new renewable energy ideas to life. As the team tackles this new project under MnDRIVE, one of its big challenges has also been one of its greatest strengths: the need to navigate conversations between vastly different disciplines. “I find it incredibly rewarding working with professors across a variety of disciplines,” Seiler said, adding the meetings are great learning experiences. “These collaborations ensure that my technical work considers the reality of energy policy and legal issues." Seiler and assistant professor Sairaj Dhople, Ph.D., an electrical and computer engineer with CSE and the group's solar expert, are heading up the technological side of the discussion. Dhople is examining how several small-scale energy distribution systems can work together in place of a single large, centralized power station. Part of Wilson’s efforts will include figuring out how Seiler and Dhople’s concepts fit into the existing electricity system and work with rural electric co-operatives like Great River Energy, the state Department of Commerce and the Midwest Independent System Operator (MISO) to pinpoint what economic, institutional and policy barriers need to be considered for technology development. Meanwhile, Tim Smith, Ph.D., associate professor and director of the U's NorthStar Initiative for Sustainable Development, will work to examine how corporate partners make decisions and investments about how to manage their power usage and adopt new technologies.